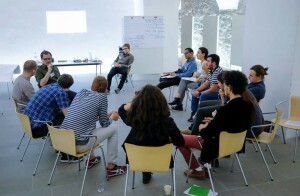 At the FutureLab 2015 I attended the learning circle Economics, which was coordinated by Moritz Linder. The sessions were about how to get more pluralism in the monotone and mainstream sciences of economics, so that students and professors get another view on how to teach and research on certain issues and matters and start thinking out of the box. In the first session we learned about different movements of pluralism and where we can inform ourselves if we want to get more involved and to start something at our own universities. If you are interested in this topic, please check out following: Peps Èconomie (France), Netzwerk Plurale Ökonomie (German speaking countries), Rethinking Economics (International), JEC group (Argentina) and ISIPE (international). After learning about these, the discussion focused on how to define economics. This discussion was on the one hand very interesting because you heard a lot of different opinions. But on the other hand it was complicated because it was easy to lose track of the main issue and to drift in abstract spheres, which had little to do with economics. Never the less, one point we all agreed on was that economics are not a natural science, where you can reproduce the solutions over and over again. But they are a social science, which heavily depends on the assumptions and parameters of the theories. Every single one of these showed an exciting, new look on existing mainstream point of views. I want to give you a quick overview on the rebound effect, as I think this is the most interesting topic of the four. The rebound effect means that despite the fact that our technology and world gets more and more efficient, we use more resources as e.g. 100 years ago. By resources I mean, energy, fuel or your own time. A short example will clear this up: our cars get faster and faster, so we are able to travel a much larger distance in a shorter period of time, but we still travel one hour to get e.g. to work. So we have not saved any time, despite our faster cars. Another good example is that when we produce a solar plant we can save oil. But in the making process we waste so much other materials and after use these plants cannot easily be disposed, which is also a waste of resources. There are tons of other examples. To give a short summary about the whole circle, I have to say that I have learned a lot. Not only because we read papers which do not have a mainstream thinking, but also because there were so many different and brilliant discussions and thoughts. Hope the next FutureLab will also be that interesting!